First of all, a control fire test based on DIN 4102-7 was carried out in accordance with test procedure 1 of DIN EN 1187. The build-up was not affected. The testing equipment for test procedure 3 with blower and radiant heater and a 1.2 x 3.0 m green roof build-up, initially without vegetation. Approx. one minute after the two incendiary agents were put in place, the flames, fuelled by the airflow from the blower, were up to 50 cm in length (photo shows a build-up with Floraset® FS 50). 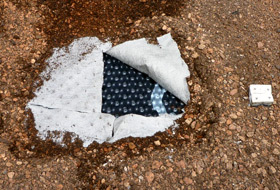 Despite the fact that shortly after the end of the test the surface temperature of the substrate layer was about 300 °C, no effects of the fire were observed on the filter sheet or the drainage element (photo shows build-up with Floradrain® FD 25). 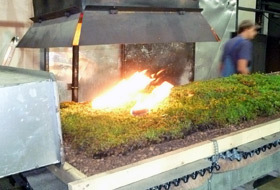 The test was passed even with a vegetation mat in place; the incendiary agents extinguished after 12 minutes without the vegetation catching fire. After the incendiary agents were extinguished, the radiant heat continued to be applied until the end of the 30 minute test. This led to the vegetation drying out across a diameter of about 80 cm. After the end of the actual test, the dried-out area was set alight using a naked flame applied externally. The fire extinguished of its own accord after 2 minutes. The area of the vegetation mat that was still “damp” was unaffected. As early as 1988, ZinCo commissioned the “Forschungs- und Materialprüfungsanstalt Stuttgart” to carry out fire protection tests on green roof build-ups, in line with DIN 4102, Part 7. The results from the 1988 tests are one reason why green roofs in Germany are now classified as “hard roofs”, that is to say they are considered to be resistant to sparks and radiant heat. As specified in the standard, the incendiary agent for the tests consisted of a wire frame, 30 x 30 cm in size and filled with 600 g of conditioned wood wool. This fire test was carried out at an inclination of 15° and is still valid today. As part of the harmonization of European Standards, it is referred to as “Procedure 1” in DIN EN 1187 “Test procedure for the external fire exposure of roofs”. Given that not all countries apply this test and that there are three other test procedures available in Europe in addition to “Procedure 1”, ZinCo decided to carry out fire tests on green roof build-ups once again. The idea here is to convince the sceptics of the fire safety of green roofs, in those countries where the “German test” is not used. In the end, we opted for “Procedure 3”, which originates from France. This test is considered to be the most stringent as it includes air flow at a speed of 3 m/s from a blower, and radiant heat from a flat radiant heater with a performance of 12.5 kW/m², in addition to the two incendiary agents. 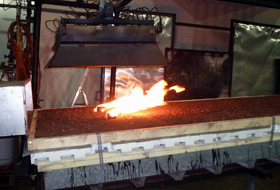 The fire testing was carried out in the fire testing facility at the “Forschungsstelle für Brandschutztechnik” at the University of Karlsruhe. 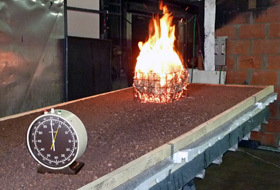 The build-ups were subsequently classified by the “Materialprüfungsanstalt (MPA)” of the University of Stuttgart, which is a notified European fire testing body. For the tests, two identical 1.2 m x 3.0 m roof build-ups were made. They consisted of galvanized, trapezoidal sheet metal profiles, 60 mm thermal insulating boards made of PIR foam with an interlocking profile and a single-layer waterproofing sheet made of thermo-plastic polyolefin (TPO). The waterproofing layer and the insulation were each attached mechanically to the long edges with five oval holding plates and roof construction screws. Green roof build-ups were then added to the two sub-constructions. One build-up consisted of a 5 mm thick protection mat made of polypropylene, 25 mm thick “Floradrain® FD 25” drainage and water storage elements made of thermoformed polyethylene, a thin filter sheet made of polypropylene and a 50 mm thick substrate layer of system substrate “Heather with Lavender” held in place with a wooden frame. The second green roof build-up consisted of 50 mm deep “Floraset® FS 50” expanded polystyrene (EPS) foam elements as drainage and water storage elements and a polystyrene fibre protection mat. The remaining layers were identical. The finished test build-ups were stored in the testing facility for about a week prior to testing, to allow the damp content of the substrate, which was supplied in sacks, to adapt to the ambient conditions. The tests were carried out in mid-June 2011 at an inclination of 5°. The procedure was identical in each case. First of all, the radiant heater was pre-heated for 3 minutes. Then the two incendiary agents were put in place at the same time. The naked flames of the incendiary agents extinguished after about 10 – 12 minutes. Finally, the build-ups continued to be exposed to radiant heat until the end of the test (test duration without pre-heating 30 minutes in total) and were observed. The tests showed that the fire neither spread nor burnt through. A substrate surface temperature of about 300 °C was measured some 5 minutes after the end of the test. 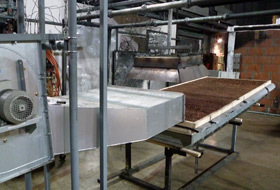 When the system substrate was removed the temperature measured at the system filter sheet was found to be only 40 °C. 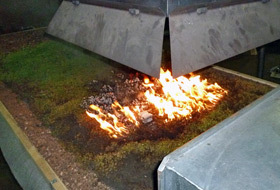 No effects of the fire were established from the system filter sheet downwards (including drainage and water storage elements Floradrain® FD 25 and Floraset® FS 50). After the end of the second test, we took the opportunity to return to test build-up no. 1, which was now cooled down. Given that this build-up remained virtually unaffected by the preceding fire test, a 1.0 x 2.0 m vegetation mat was placed on it. The mat had already been prepared and was pre-cultivated with various sedum types. The fire test was repeated in accordance with Procedure 3, which included incendiary agents, wind and radiation. Once again, the incendiary agents extinguished after about 12 minutes without the vegetation catching fire. During the next 20 minutes, as a result of the radiant heat, the vegetation mat dried out to such an extent that it was possible, after the end of the test, to light this dried-out stretch of about 80 cm diameter using a naked flame. However, the flames extinguished once again after about 2 minutes, without spreading beyond the dried part of the build-up. Even with vegetation, the “fire test” was passed in compliance with the standard test. 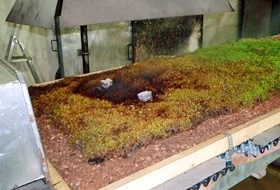 All three tests have shown that a green roof build-up with a substrate layer thickness of at least 5 cm and a substrate that does not contain more organic material than the ZinCo system substrate “Heather with Lavender”, can be classified as BROOF(t3) in line with Part 5 of DIN EN 13501 “Fire classification of building products and construction elements”. Based on the Karlsruhe test results, this classification was subsequently awarded by MPA Stuttgart, a body certified to do so, for roof slopes of up to 10 °. A green flat roof classified as BROOF(t3) is resistant to sparks and radiant heat. That means that a green roof build-up would prevent the spread of fire across the roof and the transfer of fire from the roof into the interior of the building, in the case of the roof being exposed to external fire for at least 30 minutes as per the requirements of the test standard. Even if the four test procedures are not directly comparable, and EU Member States can choose one of them in line with their own national safety standards, exposure in the case of test procedure 3 is particularly severe, as it includes incendiary agents, wind and also radiant heat. This offers the greatest level of protection for the building owner. It will also certainly help to convince the authorities and insurance companies of the safety of green roofing in those countries where there may be no fire protection regulations for green roofs, such as exist in Germany.